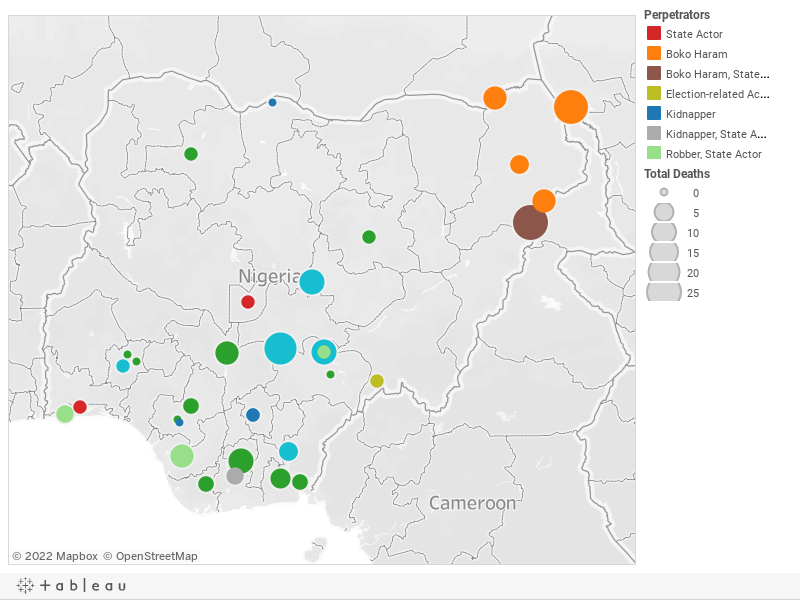 Below is a visualization and description of some of the most significant incidents of political violence in Nigeria from March 16 to 22, 2019. This update also represents violence related to Boko Haram in Cameroon, Chad, and Niger. These incidents will be included in the Nigeria Security Tracker. March 16: Sectarian violence resulted in ten deaths in Sanga, Kaduna. March 17: A cult clash resulted in ten deaths in Owerri West, Imo. March 17: A landmine killed eight in Gwoza, Borno. Boko Haram was suspected. March 17: Sectarian violence resulted in four deaths in Biase, Cross River. March 18: Boko Haram killed five in Michika, Adamawa; Nigerian troops repelled the attack and killed "many" (estimated at twenty) Boko Haram militants. March 18: Sectarian violence resulted in "many" (estimated at twenty) deaths in Agatu, Benue. March 18: Boko Haram killed four farmers in Askira/Uba, Borno. March 19: A cult clash resulted in eight deaths in Lokoja, Kogi. March 19: A policeman killed a civil defense officer in Abuja. March 19: Herdsmen killed ten in Guma, Benue. March 20: A cult clash resulted in five deaths in Itu, Akwa Ibom. March 20: Bandits killed a policeman and abducted six in Anka, Zamfara. March 21: Herdsmen killed one in Ezeagu, Enugu. March 21: Boko Haram killed eight in Diffa, Niger. March 22: Boko Haram killed twenty-three Chadian soldiers in Dangdala, Chad. March 22: Election-related violence resulted in one death in Ussa, Taraba.